This recipe couldn’t be more simple and it turns out amazing every time. The coleslaw is great on its own as a side dish but is also amazing stuffed into a pulled pork sandwich with pickles on a hamburger bun. This recipe makes enough for about 20 people, but coleslaw makes great leftovers and is even better the second day. 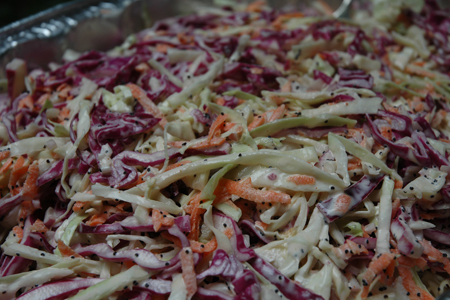 It is hard to make less if you want to include both green and red cabbage and don’t want to waste any cabbage. 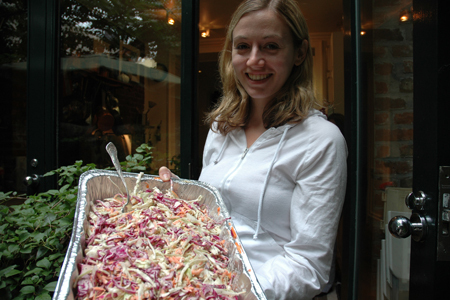 Alternatively you can make one color coleslaw. Just use only one head of cabbage and halve the rest of the ingredients. 1. In a large bowl or stock pot combine cabbage, carrots, and shallots and toss to combine. 2. In a separate bowl combine all the dressing ingredients and stir to combine. 3. Pour dressing over cabbage mixture and toss to combine. 4. Transfer dressed cabbage mixture to a serving bowl. 5. cover with plastic wrap and refrigerate until ready to serve and at least one hour prior to serving. No Labor Day weekend would be complete without beer milkshakes and beer floats. 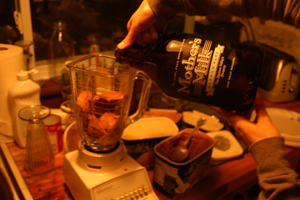 We used a beer called Mother’s Milk, a milk stout from Keegan Ales, a local brewery in Kingston, New York. 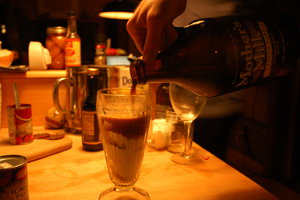 The milk shake was made with one part beer and two parts chocolate ice cream. The float was made the traditional way — a pint of beer with a scoop of vanilla on top. Both were delicious! 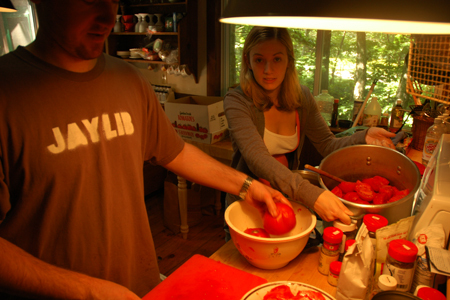 Jesse and Emily hard at work! 1) Stew tomatoes until boiling, then puree. 2) Saute onions and shallots in 1 Tbsp olive oil until soft and golden. Add dried herbs. Saute until fragrant. 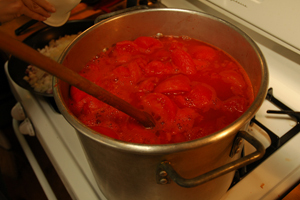 3) Add onion mixture to pureed tomatoes. Add fresh herbs, sugar, sat & pepper. Bring to boil, then reduce to simmer. 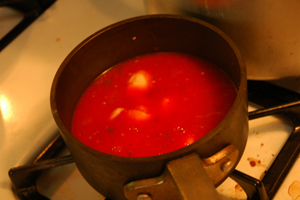 4) Remove 3 cups sauce to small sauce pan. 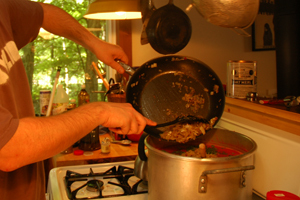 Put peeled garlic cloves into small sauce pan and simmer until garlic cloves are soft. 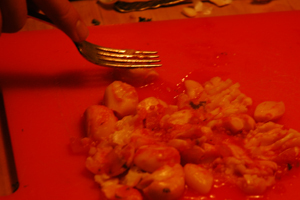 5) Remove garlic cloves with slotted spoon to cutting board. Crush garlic with fork into mash and stir back into small sauce pan. Stir sauce from small sauce pan into larger pot. Add tomato paste. 6) Continue to simmer 5-6 hours. 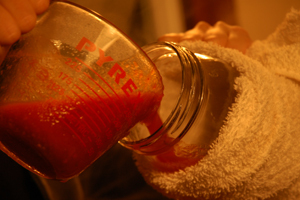 Skim off bright red foam periodically as it contains the acid from the tomatoes. 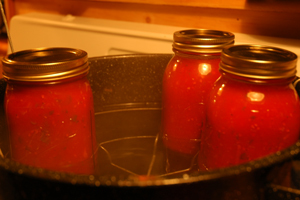 7) Process tomato sauce in a a hot water bath with in sterile jars and lids. 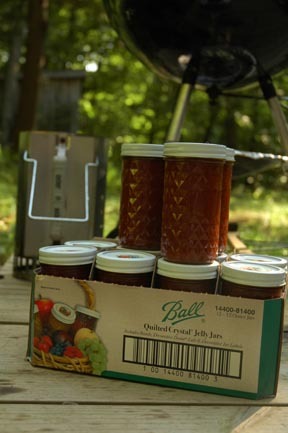 Makes 6 quart jars and 6 pint jars. This year we’ll have to find another name. 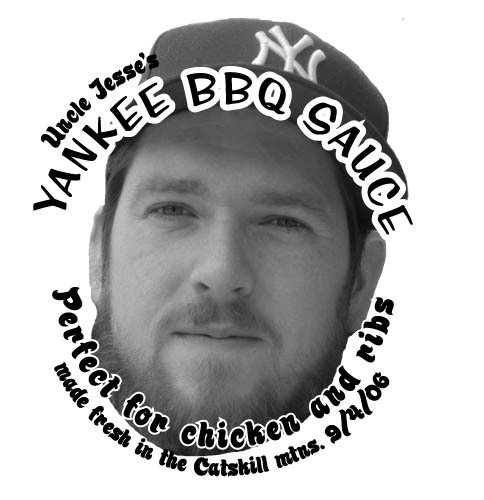 The recipe is adapted from Cooks Illustrated basic BBQ sauce. 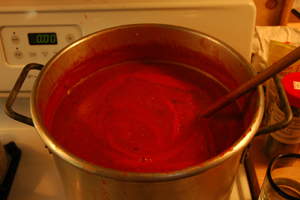 The following is for one batch, we quadrupled it, yielding enough sauce for eleven full 12 oz. jars, plus enough for dinner of brisket that night. 1) Saute onion with 1 tblsp vegetable oil, until onions are soft and golden. 2) Add remaining ingredients, stir and bring to boil. Reduce heat and simmer with cover off to reduce. 4) enjoy on your favorite slow smoked chicken, ribs, and even brisket! 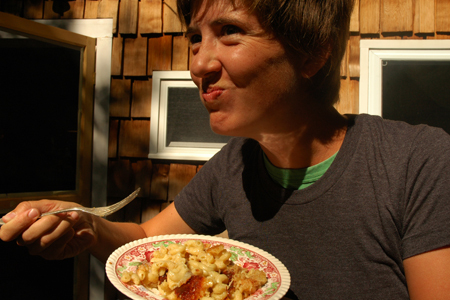 Mac n’ cheese is great for a crowd. It takes just as much time make one tray as it does to make two so we always make two and save one for later. Over low heat melt butter in thick-bottomed stock pot. Ad flour and cook stirring until four turns light brown. Slowly pour in milk into pot stirring constantly so lumps don’t form. Ad nutmeg, cayanne pepper, mustard, and Worcestershire sauce. Bring to a simmer stirring constantly so it dosen’t stick to the bottom. When mixture thickens add cheese in three batches letting each melt before adding the next. Taste and add salt and black pepper to taste. Pour mixture over cooked and drained noodles and mix to combine. Pour noodles evenly into two trays. Mix breadcrumbs with olive oil and grated Parmesan cheese and salt and black pepper to taste. Sprinkle breadcrumb mixture evenly over the two pans of noodles. Cover pans with tin foil. Cook covered in oven for 30-40 minutes and cook an additional 10 minutes uncovered until tops are light brown. Let sit ten minutes before serving. 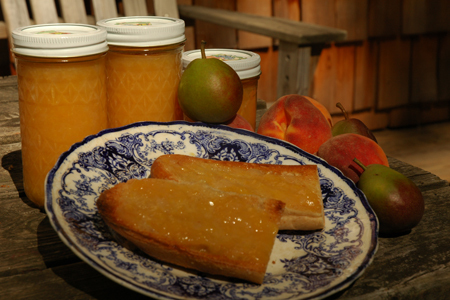 We chose to can peaches and pears this year because they were ripe and in abundance. We made peach and pear spread and made it entirely without sugar. 1/2 tsp saltPeal, pit, and finely chop the fruit. Save the juice and add juice and fruit to a non-aluminum stock pot. Ad apple juice, cinnamon, lemon juice, agave, honey and salt and cook until the fruit is soft, 15 – 20 minutes. Remove from heat. Ad pectin and gelatin and stir well. 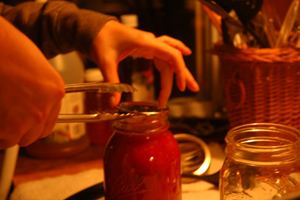 Pack into hot, sterile 1/2 pint or pint jars, leaving 1’2 inch at top. Top with hot sterile lids and process in a boiling water bath for 7 minutes after the water has returned to boiling. Put all of the above in a pot and bring to a rolling boil. Then set aside and cool completely. The cucumbers were put into a 2 large jars, along with the garlic and dill (we put crushed red pepper in one, and that was great). 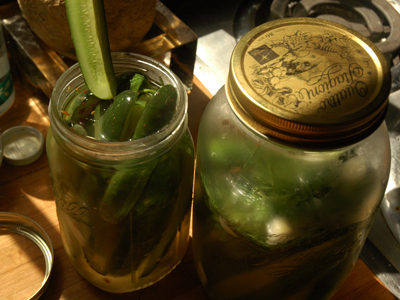 Then pour the cooled brine into the jar, put on lid and store in refrigerator, (must be put in a refrigerator). After 24 hours they are done, but if you leave for 48 hours they taste even better. Fresh pickles out of the fridge 36 hours later, though we ate them with dinner the night before. Mmmm…. 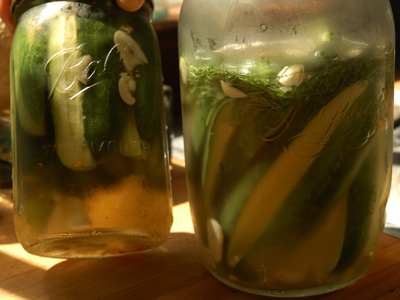 spicy half sour pickles, in one day. Really crunchy too.